After more than tripling in price this year, Lithium is no longer that dull commodity we take for granted in our consumer electronics: It's the commodity powering the next, undeniable energy revolution. The tight supply picture emerging as electric cars, mega-batteries and massive energy storage solutions become the cornerstones of our lives could be on the edge of turning new lithium explorers into the next barons. Lithium now appears to be at a crucial moment in time: The moment when profits in the industry begin to elevate market valuations, and when consolidation starts to boost gains for all those junior explorers who have been scooping up land in the world's lithium sweet spots. "This is a market that will not slow down and wait for anyone," Iain Scarr, VP of Exploration and Development for Millennial Lithium Corp --a developer with key acreage in Lithium-rich Argentina told Oilprice.com. The lithium ion battery market is forecast to expand to $46.2 billion through 2023, which represents an 11% average annual growth rate. No wonder Warren Buffet is investing heavily in lithium, especially in view of the shortage that banks and market researchers are expecting. Further down the supply chain, the Berkshire Hathaway-backed BYD has become China's single largest electric car manufacturer. Europe is working towards mandating electric vehicles by law. The Netherlands has already laid down the law: All cars on the road have to be electric by 2025 and Germany has followed closely in their tracks. China is again a powerhouse here, so investors should be keeping a close on developments there because this is a key driver of the "white gasoline" explosion. China's Tianqi Lithium Industries is gearing up to build a US$306-million plant in Australia, to open already in 2018. And the battery ‘gigafactories' are lining up. Tesla's has already opened in Nevada, and 11 more are in play. 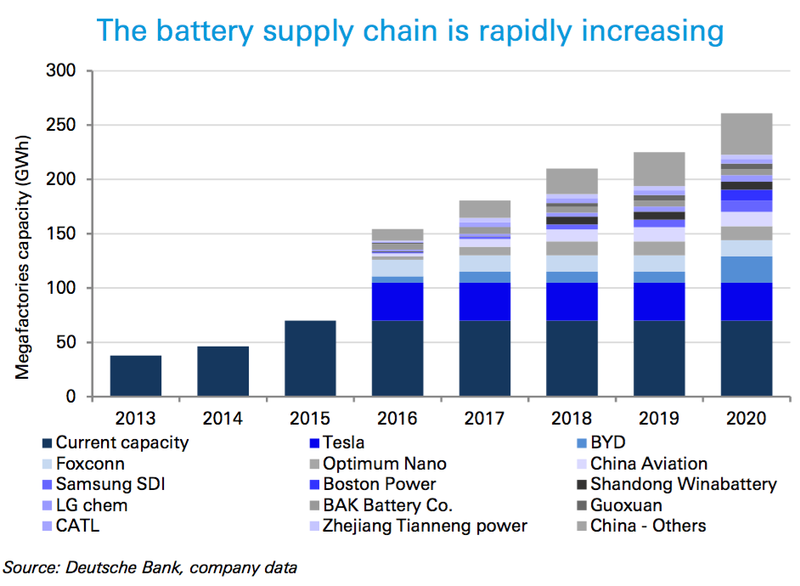 The battery supply chain is exploding, and the math is brilliant: It means that lithium battery production capacity is set to triple by 2020. "Lithium will be the biggest disrupter on the energy market. And the big winners will be those that have the funds, expertise and capacity to ramp-up production as quickly as possible," says Millennial's Scarr. We are also at a very crucial moment in time for the next round of lithium contracts, with some very interesting debates about how tight supply actually is, and where prices might be going. Formal talks for Chinese lithium contracts are set to begin in the fourth quarter, but buyers and sellers are already holding informal talks. There is a bit of uncertainty because of the short-term uptick in production of lithium in Australia with two new projects online, but delays in this supply could also be a key determinant of next year's prices. Galaxy Resources Ltd will start shipping its first lithium to China in December now—two months later than expected, and even then it could take three months or more to turn this raw material into lithium carbonate and hydroxide. "This means prices for 2017 could very well respond upwards," says Millennial's Scarr. As the debate unfolds, Macquarie Research in early August suggested we might be looking at a temporary state of lithium oversupply beginning next year, thanks to the new Australian projects. But Macquarie didn't have the benefit of knowledge at the time that the first of these shipments would be delayed until the end of this year. Lithium expert Joe Lowry, president of Global Lithium LLC, didn't mince words when he took on Macquarie's figures in his twitter feed, calling on analysts to revert to "common sense" here and noting that problems in lithium ‘execution' will continue to keep prices up. "Our new fuel is stored energy," says Scarr. "Lithium is key to that storage, and supply has some serious catching up to do in this respect. We've already seen delays coming out of Australia that indicate this market is still tight." "This is a race where the next four finishers win. Brine or hard rock #lithium doesn't matter, new resources do," Lowry notes on his twitter feed. Right now, most new projects are very early stage so ramping up supply isn't that easy in the short- to mid-term. In 2015, according to Macquarie Research, demand for lithium already outstripped supply, while this year, lithium output will again fall short of demand. In 2017, we may see a temporary equilibrium with some new production, but it will be a short spurt and, indeed, the calm before the storm. And the two best places to be in this calm before the storm are the ‘Lithium Triangle' between Bolivia, Chile, and Argentina. As much as 75% of the world's lithium reserves are concentrated in the ‘Lithium Triangle', so any miner with a presence there stands to benefit in a major way. The lithium feeding frenzy has only just begun, and right now we're staring down the mouth of the most lucrative commodity we've seen in a very long time. And while the Lithium oligopoly is already dead for all intents and purposes, the real value is in the juniors making new Lithium discoveries. Lithium stocks have led the market for the past two years—and this year they'll probably lead it again. So what happens next year? Well, next year is the real break-out year where pretty much everyone is expecting a dramatic run on Lithium stocks. This most precious commodity of our time has been dubbed the "new gasoline" by Goldman Sachs, and the "world's hottest commodity" by the Economist. Even the U.S. Geological Survey recognizes the dramatic cliff we're standing on right now, noting: "Lithium supply security has become a top priority for technology companies in the United States and Asia."